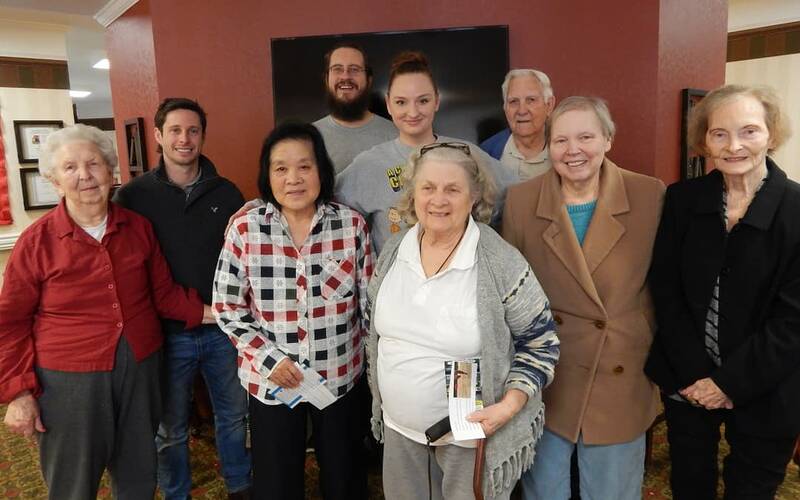 RICHMOND, KY — Madison County Library hosted its Senior Wellness Series, encouraging older adults — like Morning Pointe of Richmond residents — to practice flexibility inside and out. Led by Emily LaDoceur, certified yoga instructor, and Rhett Kenny DC, of Inside-Out Chiropractic in Berea, the program stressed the importance of exercise in every stage of life. Wellness is at the center of the life enrichment program at Morning Pointe, as the senior living community partners with local organizations to encourage healthy lifestyles for residents of any age. Photo: (front row) Ogal Spicer, Mitsue York, Janice Wallace and Martha Lou Morris, Morning Pointe of Richmond residents, (back row) Rhett Kenny DC from Inside-Out Chiropractic in Berea, Brandon Thompson, outreach coordinator ordinator for the Madison County Library, Emily LaDoceur, certified yoga instructor for the Madison County Library and Elzie Nicely, Morning Pointe of Richmond resident struck a pose during the Senior Wellness Series presented by the Madison County Library.